Mauve-blue, quirky, fragrant flowers unfold backwards over an extended period in the summer. It is a great cover crop and can be used as part of a guild under fruit trees and shrubs. Last summer we grew phacelia beneath a row of sea buckthorns, but the plant also does well in full sun. Direct sow or broadcast seeds after last frost. 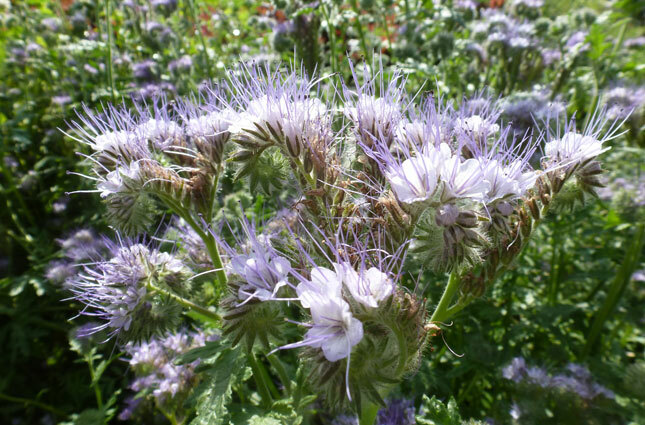 Phacelia will self sow, but does not become a weed in the garden. Seeds can be collected at the end of the season. Plants are easy to pull and can be used in making compost. The flowers are quite attractive to bees, hoverflies and other beneficial insects.